If you’ve felt like it’s been crickets and radio silence here on the blog… my apologies! We’ve been transitioning home after 4 months in Memphis with our daughter who has been going through cancer treatment at St. Jude. It has been a whirlwind of a few months for sure. I love creating and sharing… so I definitely hope to be blogging again soon. Be sure to scroll through the archives in the mean time… There’s a year of fun freebies and resources to pick from. A Large Pencil Case, similar to THIS ONE. Although I might need two or three… I have A LOT of pens… it’s a real problem. A Home Office/ Crafting space of my own. I particularly like the one with the grey chalkboard wall in this post. A Nice Paper Cutter … something like THIS. More Pens… because… you know… I have a problem. THESE are next on my list! A Good Printer that doesn’t go through ink like my kids with money at an arcade! Any suggestions… I’m yet to find my true love printer! Project Sticker Paper for printing all the things! Uninterrupted Time to Plan and Craft!!! 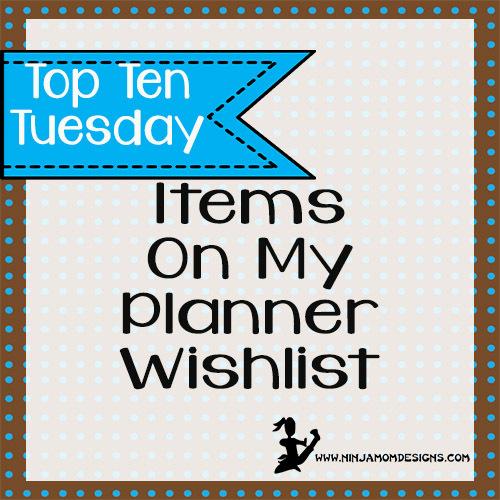 What’s on your Planner Wishlist??? Prayers for your daughter and your family! I just wanted to put in my 2 cents worth on the stickers you chose. They are awesome for shipping. I use them all the time. I haven’t used them for planner stickers but I really think they are going to be too heavy for most planner pages. OnlineLabels.com has some great choices for lables…sheets, precuts, clear, colored…I believe you can order 2 sample sheets. The samples I ordered were white and used to label soap and sugar scrub for my daughter’s baby shower. *I am in no way affiliated with Online Labels…just a happy user! Great to know! I’ll give them a try since I have a couple of packs of them! Best decision I ever made on a printer was an HP printer that can use instant ink. You choose one of 3 plans based on the number of copies you print. You can change it at any time. They send you ink when your machine lets them know you are running low. They send long before you will actually need it. Plans range from $2.99 for 50 pages to $9.99 for 300 pages. If you go over they charge you a set amount for a certain number of pages (varies slightly depending on which plan you are on). You can look up to see how many pages you have printed as well.